ECE accident alert with automatic dialer project is an useful one for all kind of peoples. Technically it is used to develop a safety feature in vehicles. And mainly it is used to control accidents and can use this in emergency time. This is a final year ECE project. It can be used for electronics project in engineering and polytechnic arena. Diploma students can use this as a major or mini project for academics. 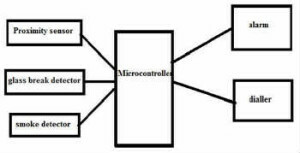 Microcontroller 8051 is playing vital role in this project. Microcontroller programs code also used to design this safety alert. This projects abstract, synopsis, block diagrams, circuit diagrams are included in a PDF file. It can be downloaded as for free. Current generation vehicles accident ratio is decreases while comparing to old models. This innovative project idea is to implement emergency system to reduce the accident risks. Because of this alarm project, we can increase the safety of automobiles. Safety is a major concern while driving. This ECE project automates the emergency alarms and it is to alert nearer persons. There is a sensor to detect the glass breakage and other breakages. If there is any fire exploit, this sensor detects and loud the alarm. This project is totally based on Microcontroller.